The Oakland Raiders visit the Miami Dolphins in Week 9 of the 2017 NFL season. PFF previews the top player matchups of the game. T Marshall Newhouse vs. 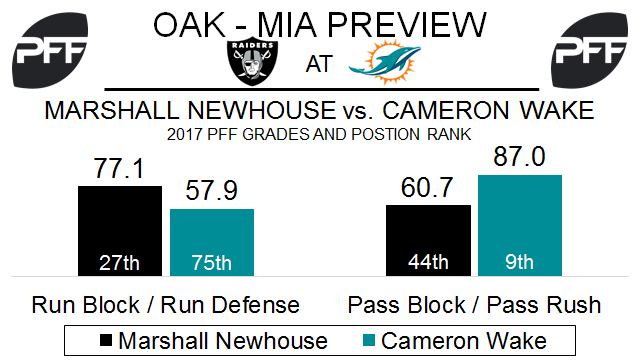 Edge Cameron Wake – Since signing with the Raiders this offseason, Newhouse has been better in the run game than as a pass protector. His 77.1 run-block grade ranks 27th at tackle, while his 60.7 pass-block grade ranks 44th. Newhouse has allowed four sacks and 13 total pressures in 241 pass-block snaps this season. He will face a strong challenge from Wake, who has rushed the passer 156 snaps this year, and all of them from the left side. He is PFF’s 11th ranked edge defender with an 85.6 overall grade. Wake is second in PFF pass-rushing productivity among edge defenders with seven sacks and 31 total pressures. TE Jared Cook vs. Safety Reshad Jones – Cook’s penchant for making big plays is something Oakland’s offense would like to utilize more often. His 75.1 overall grade ranks 12th at tight end this season, and he’s second with five missed tackles forced. Cook’s 140 routes run from the slot are the most for any tight end, and he’s fifth with 18 receptions from the slot. Jones has been tremendous against the run this season, with the fifth best run-defense grade of any safety at 87.1. However, he ranks 46th among safeties with a 74.7 coverage grade. Jones has been targeted 14 times in coverage and allowed 11 catches for 130 yards this year. WR Michael Crabtree vs. CB Xavien Howard – Crabtree has been the Raiders most reliable receiver this season, and this is a matchup they must take advantage of in the passing game. He ranks 15th in yards per route run among wide receivers at 1.99, and is 16th in passer rating when targeted at 110.3. Crabtree has been Oakland’s main red zone target this year, and his six touchdowns rank third among wide receivers. Howard is currently ranked 111th of 114 qualifying cornerbacks with a 37.9 overall grade. He’s been targeted 39 times and allowed 27 receptions, 12th most at cornerback this season. RB Kenyan Drake vs. Edge Khalil Mack – All eyes will be on Drake as he replaces the recently traded Jay Ajayi. Drake hasn’t had a lot of opportunities this year, as he has only been on the field for 46 total snaps. His overall grade in that short time is 54.7, which would rank 45th out of 54 qualified running backs. He will come face to face with Khalil Mack, who has a run-defense grade of 93.6, which is the best run grade among 108 qualified edge defenders. WR Kenny Stills vs. CB Dexter McDonald – Stills has been underwhelming this season, as his overall grade of 51.8 is 79th out of 109 qualified receivers, and he is only averaging 1.22 yards per route run, tied for 62nd out of 84 qualified receivers. He will likely see a lot of Dexter McDonald, who has struggled in his own right, as quarterbacks have a passer rating of 117.4 when targeting him, which is 11th highest among 109 qualified cornerbacks. Last week he was targeted five times by Tyrod Taylor, and Taylor completed four of those passes for 36 yards a touchdown and a passer rating of 136.3. Look for Jay Cutler to try and exploit him this week. 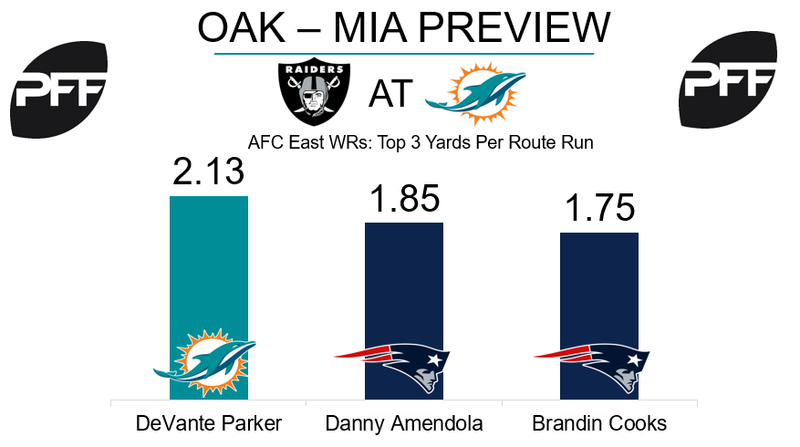 WR DeVante Parker vs. CB Sean Smith – Parker looks like he will be back in action this week, and has himself a very favorable matchup to work. Sean Smith has allowed a passer rating of 139.6 when targeted this year, the second worst in the league only to his teammate David Amerson. Smith is also allowing 1.60 yards yards per coverage snap, which is 98th out of 109 qualified cornerbacks. Before his injury, Parker was having a solid campaign, as his overall grade of 76.8 currently ranks 32nd out of 109 qualified receivers.